The film stars Nicholas Cage as Rayford Steele, who is piloting a commercial airliner when—SPOILER ALERT—passengers simply vanish from the plane as well as millions of others from around the globe. His daughter, played by Cassi Thomson, is left to search for her lost mother and brother. Ouch! Critics can be so critical! For the Lord himself will descend from heaven with a cry of command, with the voice of an archangel, and with the sound of the trumpet of God. And the dead in Christ will rise first. Then we who are alive, who are left, will be caught up together with them in the clouds to meet the Lord in the air, and so we will always be with the Lord (1 Thessalonians 4:16-17). On the contrary, the being “caught up” (the Greek word is harpazo) seems to be a noisy, raucous affair with Jesus Christ Himself coming down from heaven, the voice of the archangel, trumpet blasts, people rising out of graves, and living believers being caught up into the clouds to meet the Lord. Nothing surreptitious about this “rapture”! Compared to the 2,000-year history of Christ’s Church, the modern day concept of rapture is, well, modern. Generally, two sides are caught up in the debate. The ancient view includes Roman Catholics, Orthodox Christians, Lutherans and Reformed groups who believe this harpazo is one event that happens in the final resurrection and judgment. What is known as the “pre-tribulation” view was developed in the 1830s by John Nelson Darby and the Plymouth Brethren, and then popularized with the commentary of the Scofield Reference Bible. This group believes Christ will “rapture” believers before a time of intense “tribulation” (The Revelation’s dreadful seals, trumpets and bowls of judgment poured out on the earth) and after that, Christ Himself will return for the final resurrection and judgment. 1. Jesus will return: This is made clear in Matthew 24:3-25:46; Luke 21:7-36; 1 Thessalonians 4:13-18; 5:1-6; 1 Peter 3:1-18 and the entire book of Revelation. I have no doubts. And making movies that are more B-grade sci-fi thrillers than enlightening entertainment cheapen the profound truth of God’s mysterious workings in this world. I said nothing less or more . . . concerning the end of the world. . . . I have no opinion at all on it: I can determine nothing at all about it. . . . I have only one thing to do, to save my soul, and those that hear me. “Come, Lord Jesus! The grace of the Lord Jesus be with all. Amen” (Revelation 22:21). Copyright © 2014 James N. Watkins. First published in The Presidential Prayer Team’s Viewpoint, October 2014. From cartoon archives . . .
As a believer in Christ, the rapture is my goal, being with God the Father and Christ our Savior for eternity. The story is scary and sad, but not totally hopeless for those LEFT BEHIND. 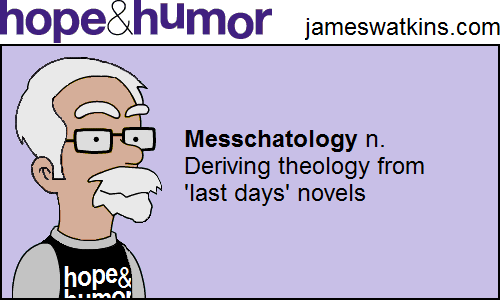 As a writer and evamgelist, I stay out of end of time discussions. Everywhere I go, evangelisits, TV hosts, and Bible studies try to draw me in and get my opiniom. I simply don’t know the answer and even if I did, my job stays the same – love God, love people, give the Gospel. I enjoy good fiction and have no problem using Biblle themes as plots but I always remind peoplr that they call it fiction for a reason. Havn’t seen the movie so can’t make a judgment on how “good” it is. I do know that if I preach rapture before I preach Jesus, people see it as foolishness and don’t get saved – which defeats the purpose. JIm: Thanks for your balanced approach based on Scripture. I have not seen this movie, and gave up on the book series after #9. I simply got fed up with tragedy and drama. Too much like real life! We are called to preach the Good News of Jesus’ death, burial, resurrection, and return. I wonder if cheap scare tactics like this win many souls. Someday–soon I hope–we will find out, when we meet Jesus. Jeanette, you’re probably not old enough to remember the 1970s film “Thief in the Night.” So many people made decisions for Christ when the lights came up, then forgot about that decision as soon as the fear of being left behind worse off. Fear is not a motivator for lasting change! Jim, Amen. Nice to hear someone else admit we don’t have the end times pinpointed. Rapture is a doctrine that may bring people to consider Christ but it doesn’t bring real conversion. When tribulation comes those who embraced faith with the rapture formula will fall away. I have a simple answer to those who want to argue rapture. If your right I will be raptured with you because I belong to him. But if you face tribulation will you be able to stand alongside me staying faithful to Him. My take on the movie is Left Behind should be left behind. All the comments the critics had are absolutely spot on. I only ever read one of the series. (As I said I’m not a rapture fan.) It just happened to be the one the movie was based on. The movie didn’t even come close to resembling the book. And the closing song You’ve Been Left Behind left me even more disappointed. It reminded me of so many of the kids in my youth group back in the 70s who clung to that theme and left the faith when life got complicated. Hi James! I am coming over from Jeanette’s blog. I really like the idea that this end-time is something I could not comprehend. It was interesting to read that the coming of Jesus will be anything but subtle! I kind of like that really. The whole sneaky, sudden disappearance is pretty eerie. When has Jesus been eerie?